Scientists Discovered That Butterflies Use A Magnetic Compass for Navigation « Adafruit Industries – Makers, hackers, artists, designers and engineers! To test for this, the scientists strapped butterflies into a flight simulator, allowing them to point in any direction while flying “on the spot”. They surrounded the chamber with a magnetic coil system and varied the inclination angle of the field – effectively changing the position of the equator and the poles. 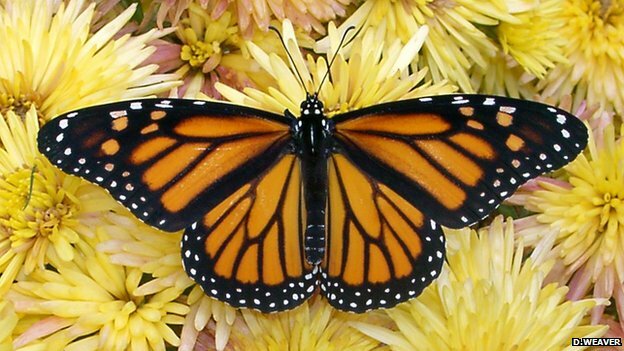 The monarchs responded by turning in the direction they perceived as south. Crucially – the magnetic compass only worked when the butterflies were also exposed to light in the ultraviolet-A/blue range. This was not present in previous magnetic experiments with monarchs – explaining why they failed to find evidence of such a compass, the researchers believe. “To our knowledge, this is the first demonstration of the use of an inclination magnetic compass by a long-distance migratory insect,” said Prof Reppert.